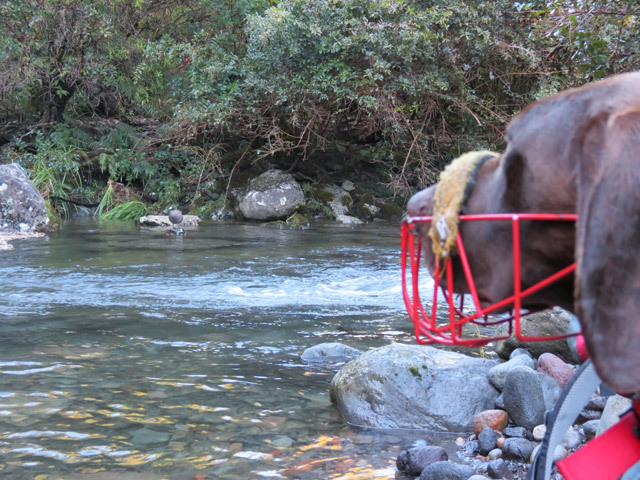 150 rubber whio/blue ducks were released on to the Upukerora River, in Te Anau, for the Great Fiordland Whio Race last weekend. The race was part of the Fiordland whio family fun day, celebrating Whio Awareness Month. It’s January 2013. I feel it’s time to leave Roy. He’s a nice guy but I don’t think he’s fatherhood material. We’ve been out here on the Peninsula now for a while, and he didn’t do a great job of incubating our eggs last year, and they failed to hatch. I can’t describe my disappointment when the rangers came and told me my egg had failed, and that I wouldn’t be a mother this year. Again! Poor genetics they said! Pffft! There is nothing wrong with my genes, it’s these men they keep trying to pair me up with! 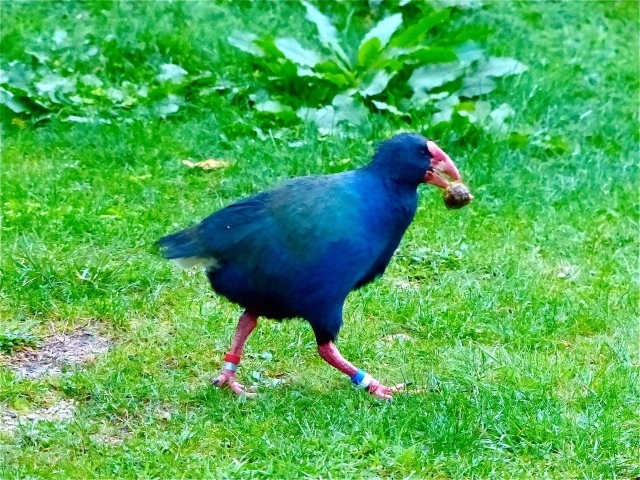 I have great Fiordland takahē genes! Time to go. And besides, I miss the fig tree at the ranger’s house. Roy never really did like figs. Dear diary, now it’s February, I packed my bags under my wing and left Roy and moved back to Home Bay. 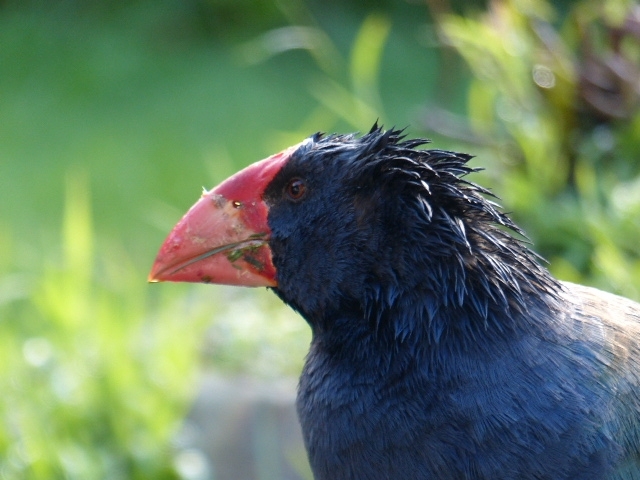 When I got here I discovered a new pair of takahē had taken over my old stomping ground. No, no, no, no, no this is not good enough! Don’t they understand the pecking order here? You can’t just arrive and expect to take up the best territory! It doesn’t work like that. But wait….that Kowhai is quite a handsome bird isn’t he? Strong looking, cute, and from Burwood Bush too—my old home. He’s not the sharpest tool in the shed, but you can’t have it all I guess. Can’t say I like his girlfriend Harper much though, too clingy, he’d be much better off without her. Dear diary, now it’s’ March. I knew it wouldn’t be hard to woo Kowhai away from Harper. She clearly underestimated the power and charm of an older woman. I saw her off with the help of my old nemeses from up the hill, The Captain and Rangi. Rangi might be in her twilight years now, but she still loves a good fracas! And they know me well enough to stay up the hill too! Now to make Kowhai mine for good! Dear diary, it’s been a couple of months now since I lassoed Kowhai. I have taught him in the ways of the fig and the feijoa, and showed him how to get the most out of the rangers here on Maud. 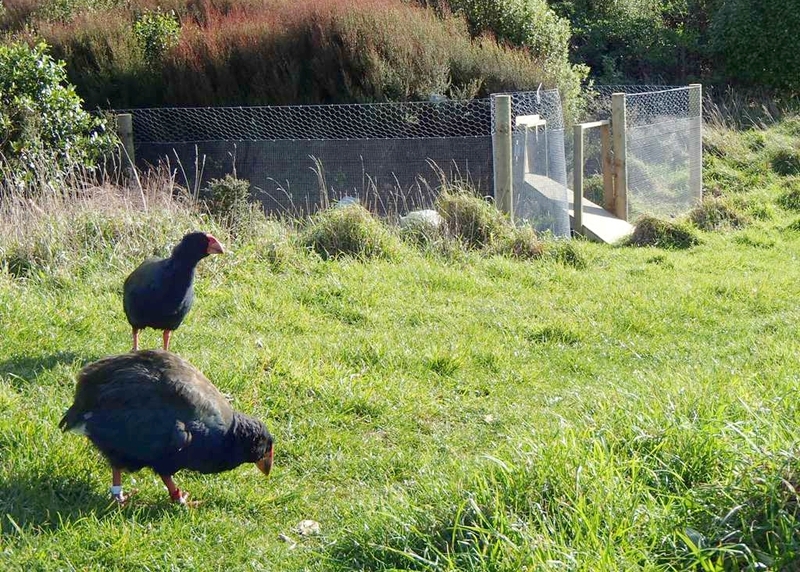 People are easy to train, takahē not so! Winter’s coming, time to batten down the hatches and hunker down. What do you think of my new hairstyle? Dear diary, it’s several months since my last entry. Things were so great for so long, now Kowhai is gone! Oh, woe is me! That strumpet Pango from over the hill came and stole him from me. Is this karma coming to burn me for taking him from Harper? Now she has paired up with Roy, and I am alone again. A girl could just cry. If takahē cried, of course. Dear diary, it’s one week since Kowhai left. I am hoarse from calling for him, but I get no reply. He must have gone off to the other side of the island. I can’t even find consolation in food anymore. Dear diary, week two of flying solo. I was just about to steel myself and head over the hill to get Kowhai back from that wanton harlot, when who should turn up? Kowhai! Seems Pango wasn’t half the woman I am! I was so pleased so to see him again, but I didn’t let on…too much. I let him know in no uncertain terms that if he did that again, the welcome mat wouldn’t be so welcoming next time. In fact, don’t bother coming back! But I love the way he grooms me, and runs around like a fool sometimes when he gets startled. This must be love? Dear diary, we made it through winter and now it is spring. I am starting to feel ‘clucky’. Kowhai and I are taking turns chasing each other round the Lodge lawn. Spring is definitely in the air! I think it’s time to show Kowhai how to build a nest. Dear diary, it’s late October now, we’ve been busy. Building a good nest takes time. Kowhai isn’t the most technically apt nest builder, but he more than makes up for lack of skill with enthusiasm! And now, guess what!? I am sitting on an egg! A creamy little speckled orb of joy! I am so excited, and so is Kowhai. It’s his second go at incubating—he tells me had a go at Burwood but it didn’t work. Never mind, with some careful guidance from an old hand like me, we’ll get there! I have a good feeling about this year. It’s hard to believe I have been in this position many times before, but never enjoyed the thrill of raising my own chick. Dear diary, It’s early November and today the ranger came and “candled” my egg. I hate this part, though I accept it’s all part of the process. I trust them implicitly with my egg so I stand up and let them take it out. I know they want it to hatch as badly as I do. They shine a torch through it and check for development in the embryo. I hear excited murmurs from them and soon my egg is placed carefully back under me. They know what I already do, it’s fertile! A mother always knows. I tuck the egg back under me and smugly drift off to sleep in my warm nest. Kowhai isn’t so sure and paces about outside. I reassure him with a few soft “narks”. Dear diary, it’s mid November now, and today my egg internally pipped! My little chick has broken out if its internal membrane and is ready to start pecking its way out of the outer egg shell! I call Kowhai over, this is the most exciting part of the whole process. I talk to it, encouraging it out of its dark calcium cocoon, it talks back, peeping away and struggling to break the outer shell with its’ cute little “egg tooth” on the end of its beak. Over the next few hours it chips away until suddenly it breaks the whole end of the egg off and rolls out, a delicate little wet bundle of joy! Dear diary, it’s been 24 hours now since our baby hatched. Kowhai and I are beside ourselves with happiness. I know the rangers are too, they knew when it would hatch and have come to listen for it. I can hear their joy when they hear it chirping away to me! I have kept it warm under me, letting it dry out and now it is a little ball of black fluff, squeaking away like crazy, so hungry, so curious to get out of the nest. Don’t be in such a hurry little one, the world will wait for you! Now the mammoth task of raising our chick begins, are you ready, Kowhai? Dear Diary, I’ve been too busy raising my precious new chick to find time for my diary. Kowhai is coping being a new dad and our crazy, hungry, and now rather loud chick is getting big—I know what they mean now when they say they grow up so fast. It has been a rough year of highs and lows, but having our new wee chick has bought a stunning end to 2013. 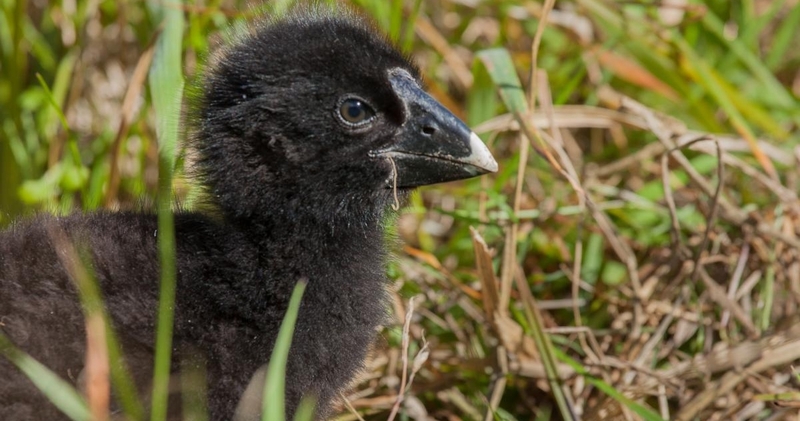 A new takahē chick to end 2013! March is Whio Awareness Month. 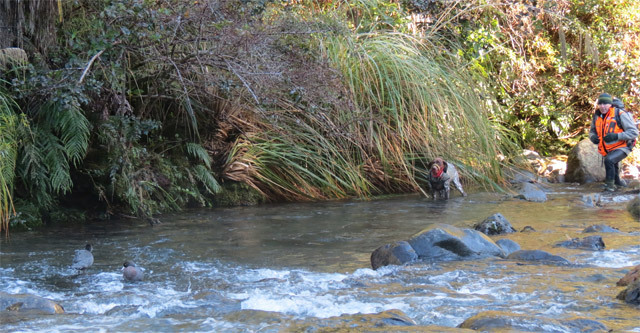 To celebrate this, we thought we would profile a slightly unique staff member, Fern the whio dog based in Ohakune. Position: Species dog – kiwi and whio. 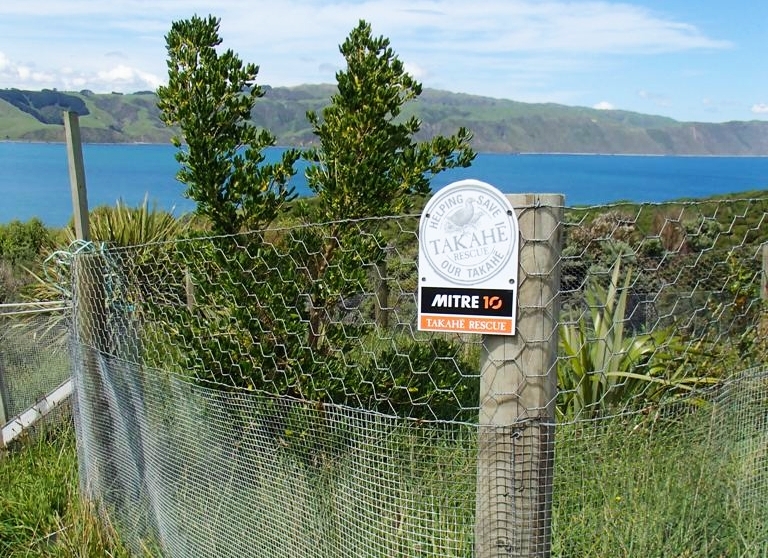 Some things I do in my job include… finding kiwi and whio that humans seem incapable of locating. It’s so easy to sniff them out and I’m not really sure why they have noses if they aren’t prepared to use them. I’m also involved in advocacy work at schools and end up with a heap of kids sitting on and around me. I don’t really mind that because the kids make quite a fuss over me, and my ranger (Malcolm) talks about cool stuff like stoats and rats and possums. 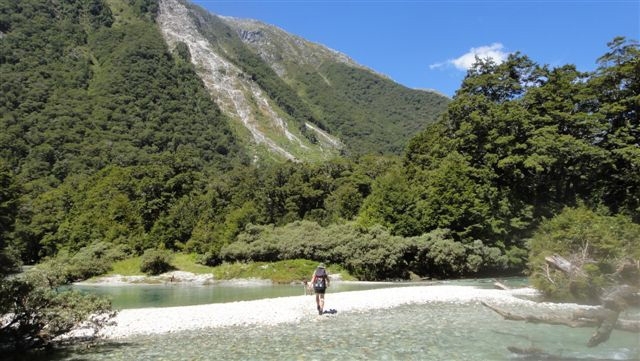 The best bit about my job is… finding whio that the rangers can’t locate and listening to them discussing when they had last seen the birds and how they thought the birds had either been preyed upon or left the area. 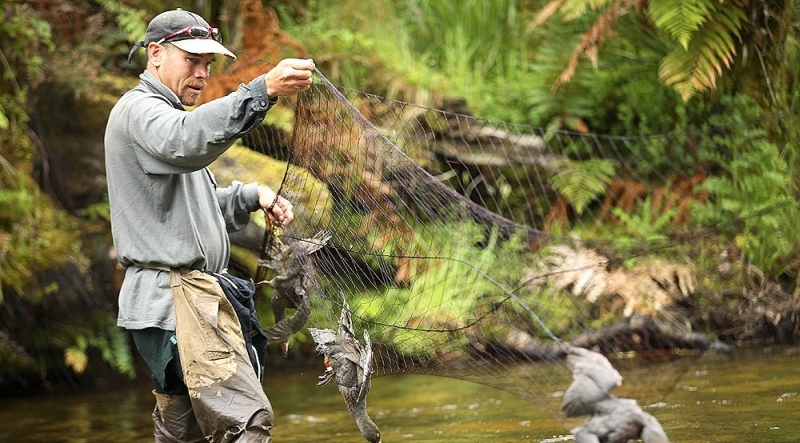 I have just started to help my ranger move the whio into nets for banding and that is very cool. I don’t like herding sheep but ducks are neat to herd and I get to swim in the deeper water because Malcolm is a bit of a sook once the water gets up to his waist. The funniest DOC moment I’ve had so far is… when we were herding ducks into a net and I had done a great job when ranger Bubs said he would move the last ducks with a volunteer (as he had a real rapport with this pair). I lay in the sun with Malcolm and then we got a radio call to say the ducks had gone to ground and they couldn’t find them. I took Malcolm downstream and located the first one in a cave but was informed Bubs had already checked that cave out. Well he must have been using ‘boys eyes’ because ranger Ali looked in the cave and came out with a whio. How surprising! Then I took Malcolm further downstream and pointed the second bird out to Bubs who actually managed to catch it. ‘At least he got that right,’ I thought to myself. When Malcolm told ranger Ali that we had caught the second bird she was very indignant as she had a huge net across the river and a heap of volunteers ready. I couldn’t help laughing to myself and I am pretty sure Malcolm had a grin on his face. 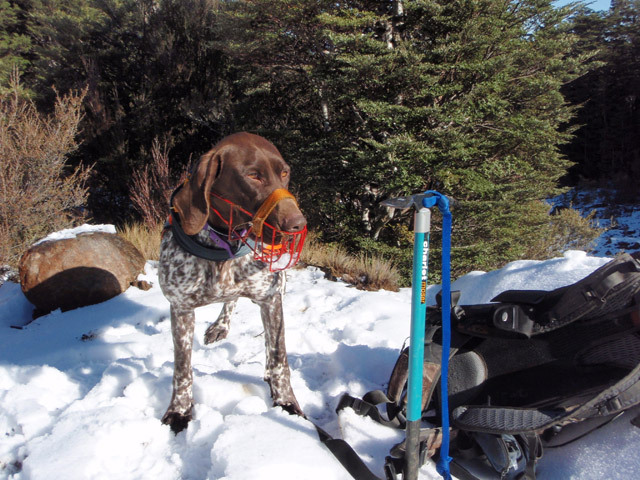 The DOC (or previous DOC) employee that inspires or enthuses me most is… Neo, a male German short hair pointer who owns Andy Glaser. He’s not quite as big as me but he is very handsome. We have discussed having puppies together at some stage. He bought ranger Andy down to Mangatepopo a few weeks back and showed me how good he was at locating and herding whio. He is seven years old and works whio very well. Once I saw him working I thought ‘I’m going to be as good as him,’ and I have stepped up to be like Neo. He said he has taught Andy all he knows about species dog work and I am teaching Malcolm so that he can work at a higher level too. The song that always cheers me up is… ‘Who let the dogs out’. My stomping ground is… Mt Ruapehu and the rivers of the central plateau. If I could trade places with any other person for a week—famous or not famous, living or dead, real or fictional—it would be… Neo. The best piece of news I’ve heard lately is… that I passed as a fully certified whio dog for the Department of Conservation. In my spare time I… rush round on Malcolm’s farm and show up the farm dogs that are slow and have noses and ears painted on their faces. If I could be any New Zealand native species I’d be… a falcon/karearea because then I could fly to the whio and give them one hell of a fright. My secret indulgence is… food and I would make a good biosecurity sniffer dog at an airport. 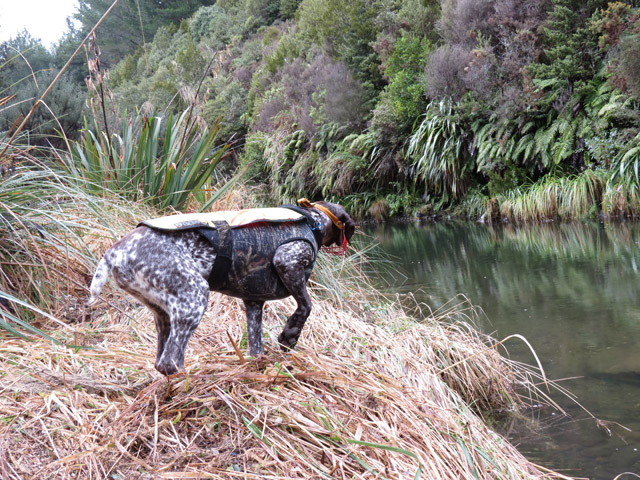 If I wasn’t working at DOC, I’d like to be… a deer dog as deer are so easy to locate compared to kiwi and whio. My favourite quote is… ‘They are still making them!’ when humans whinge about something broken or missing. The best piece of advice I’ve ever been given is… don’t be grumpy because life is too short. 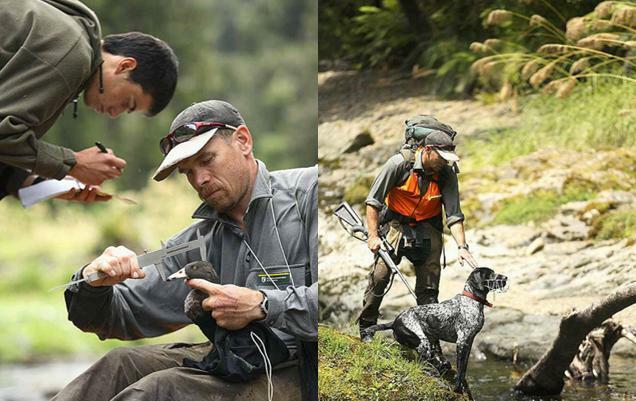 In work and life I am motivated by… DOC rangers who are so passionate about New Zealand’s environment and biodiversity. 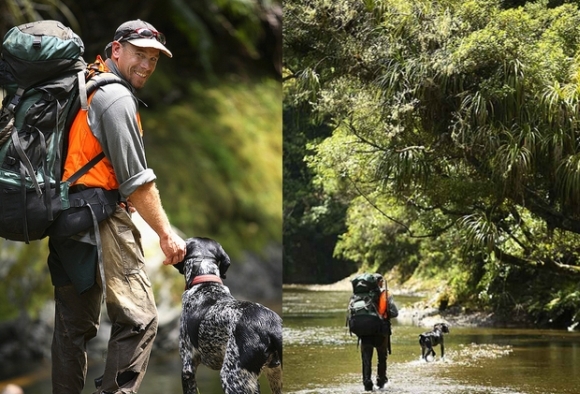 My conservation advice to New Zealanders is… look after it or lose it. 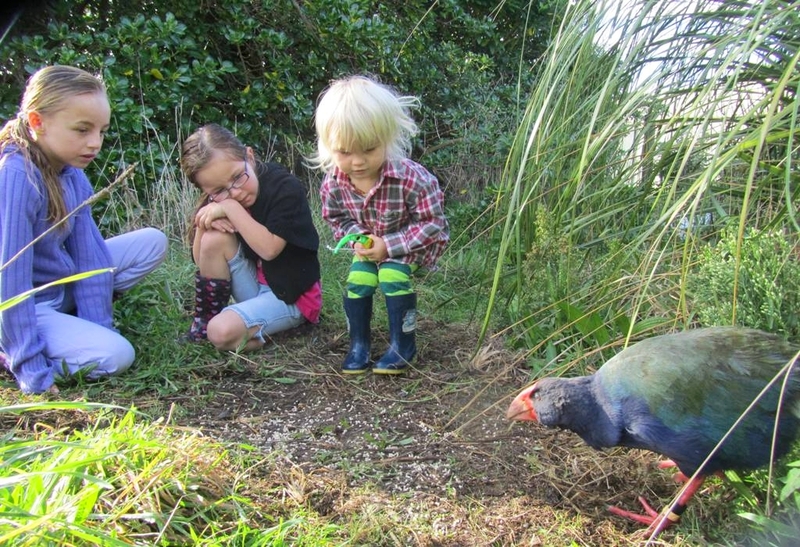 Whio family fun weekend at Auckland Zoo – Whiotastic! 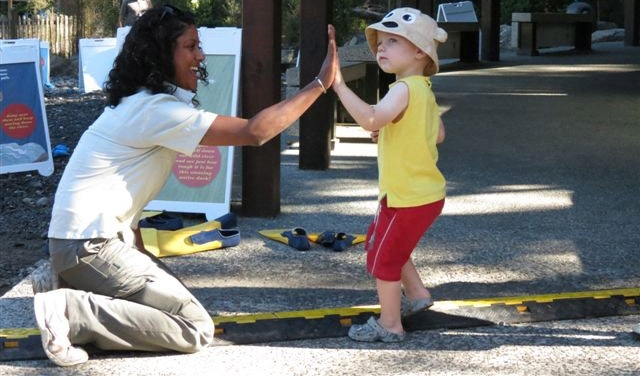 Raising awareness of whio and their importance to our environment was the objective of the whio family fun weekend at the Auckland Zoo at the weekend. And as Captain Whio, Andy Glaser, would say it was ‘whiotastic’! Over 7,000 people came through the Auckland Zoo gates over the weekend and my guess is that more than half of these came to see the new whio enclosure, take part in the Blue Duck Race, get their faces painted, talk to DOC and Genesis Energy staff, and get their photo taken in front of the giant $10 note whio billboard (check out the good looking DOC models above). The weekend kicked off early Friday morning with the official unveiling of the new exhibit material in the enclosure. For me and my Genesis Energy colleague, Jenny Burke, it was an early start to get everything ready for the guests. At 6.30 am it’s still dark and a little spooky at the zoo; there are some weird noises with all those animals waking. I am sure I heard the lion or tiger roaring for breakfast – I was just praying that they were still well locked up. Daylight was peeking through when the guests arrived at the new whio enclosure. The enclosure’s whio information was a collaboration between Auckland Zoo, Genesis Energy, and DOC. Jonathan Wilcken, Director at Auckland Zoo, welcomed more than 50 guests to the zoo for the breakfast launch. He thanked Genesis and DOC for working with the zoo staff in getting the whio information ready for opening. DOC Director General Al Morrison spoke about the importance of building on the partnerships DOC have with Genesis and extending the relationship DOC has with the zoo. 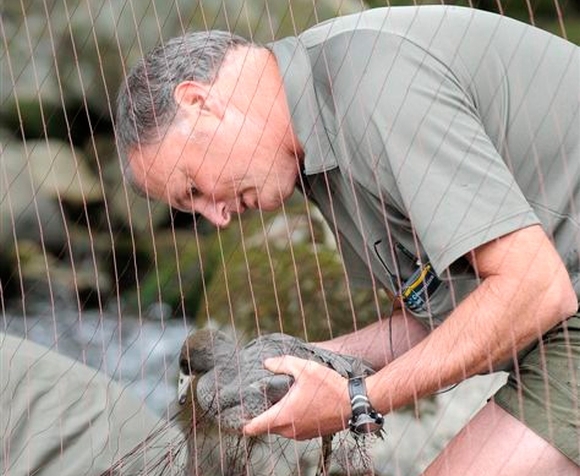 He said that with Genesis Energy’s commitment, DOC’s expertise and Auckland Zoo’s engagement we would be able to spread the whio message far and wide. 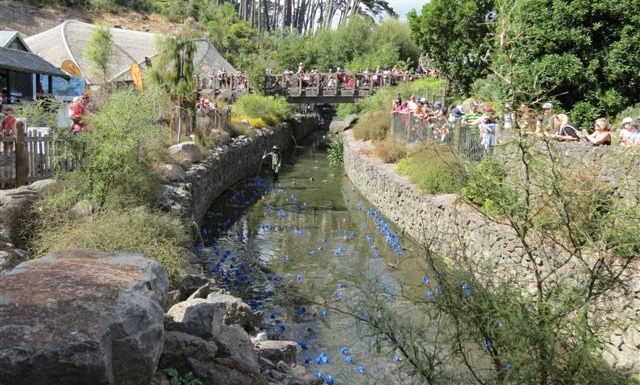 The first 500 people visiting the zoo on both Saturday and Sunday received numbered blue duck ticket for the 11.30 am blue duck race. By 10 am, on both days, the blue duck tickets had been given out. Captain Whio and his ranger team are used to getting wet when catching whio in the wild so they all donned gumboots and rubber gloves and took to the stream that ran through the zoo. Two of the rangers had the job of tipping the 500 rubber blue ducks off the bridge and into the stream when Captain Whio and the crowd completed the countdown. The whio family fun weekend at Auckland Zoo was an awesome experience and an amazing opportunity to get the whio message out. One of the highlights for me had to be on Sunday morning when I went to get breakfast before the zoo opened, walking up to the café I was met by four zoo keepers taking the cheetahs out for their morning walk. There are many New Zealanders who will most likely never get the chance to see a whio in the wild. 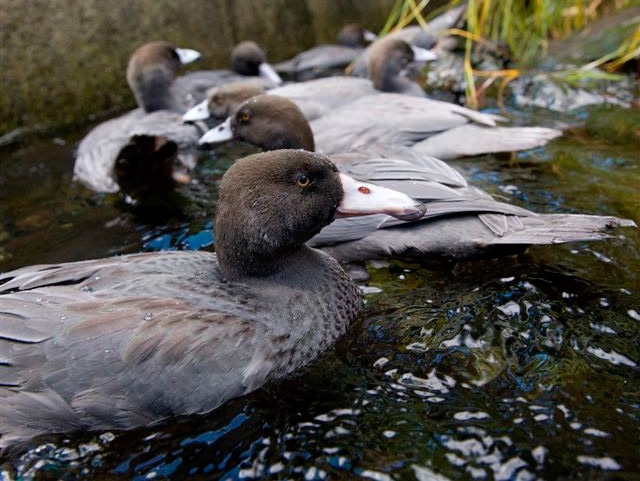 But here in the new whio enclosure, the zoo has brought the High Country to Auckland, making it possible for thousands of people each week to learn about the whio and see them close-up. March is Whio Awareness Month. 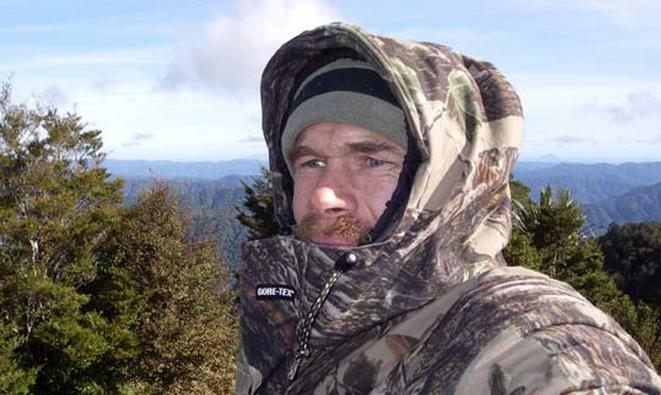 To celebrate this, we profile whio fan Andrew ‘Max’ Smart, Ranger—Biodiversity Ranger, in DOC’s Te Anau Area Office. Some things I do in my job include managing the whio monitoring in the Northern Fiordland Whio Security Site and in four recovery sites. 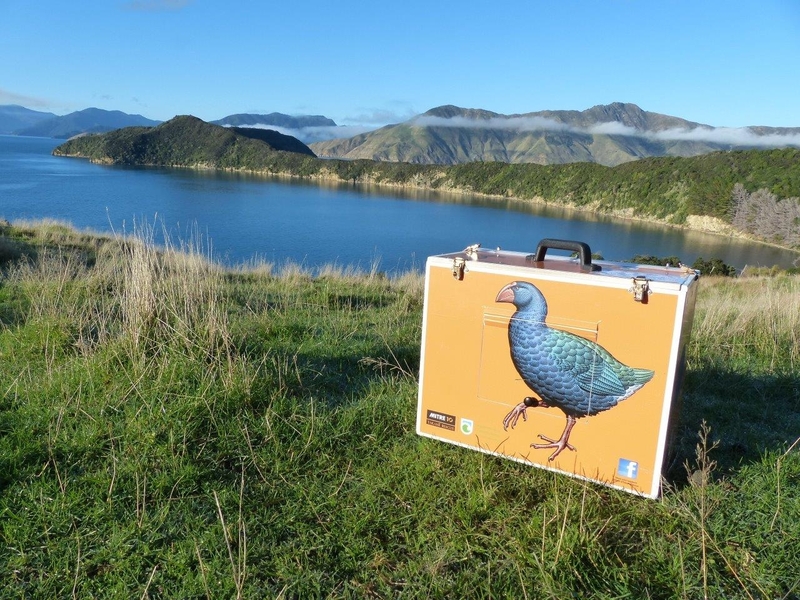 I manage the pāteke/brown teal re-introduction project in the Arthur Valley, liaise between the kākāpō team and the Te Anau Area Office, I’m the species dog certifier for the lower South Island, and assist with other biodiversity work as required (this may be translocations of tīeke/saddlebacks, kōkako, mohua/yellowheads, robins, takahē or kākāpō). 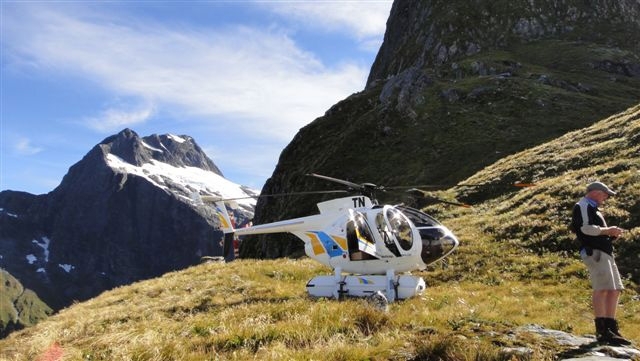 I also monitor tawaki/Fiordland crested penguins and check stoat traps in Dusky Sound. 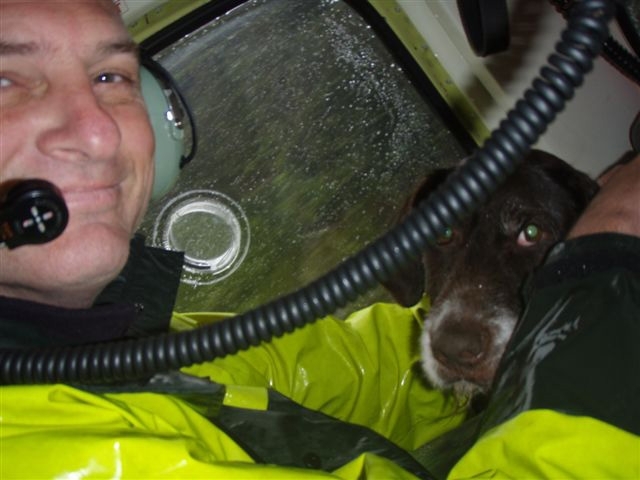 The best bit about my job is surveying for whio in wild and remote rivers with my trained whio dog and working with groups like the Fiordland Wapiti Foundation, to help protect whio habitat. It’s always nice when you feel like you are actually making a difference. Also up there is the opportunities I have had getting to places I wouldn’t normally be able to get to, like the Antipodes and Bounty Islands. 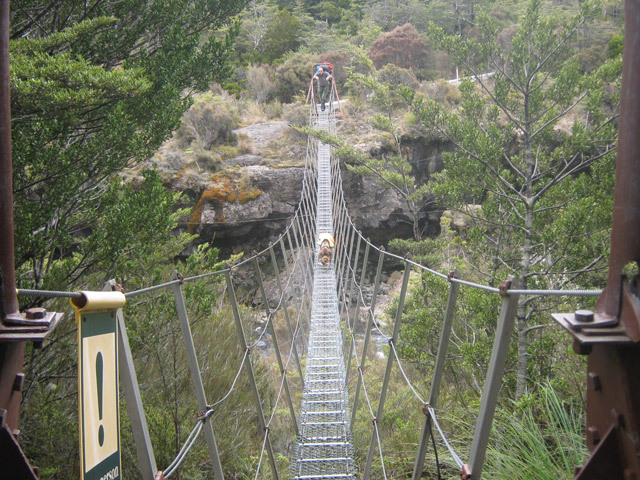 The scariest DOC moment I’ve had so far is going for a slide down a rock face in the Murchison Mountain whilst on a takahē monitoring trip on 29 February 2004 (leap day). I ended up breaking my little finger on my right hand and breaking and dislocating most of my bones in my left foot. Which surprisingly I was reasonably happy about. I remember sliding down the face and thinking ‘If I don’t grab that small tussock I’m dead’. That’s when I broke my finger and missed the tussock…. I said quite quietly in my head, ‘Well it looks like I’m going to die, this isn’t quite how I thought it would happen’, then hit the bottom and stopped. I thought, ‘Well that was lucky, I wonder where that big drop that I thought I was going to go over is?’. I looked around and I was less than a metre from it—hence why I was reasonably happy with just a broken foot and finger. I ended up in hospital for eleven days with a plate and five screws in my finger and five screws and two pins in my foot. I’ve still got the hardware in my finger and quite large bone spurs in my foot where the screws were. My foot gets really sore and stiff after doing a river survey, especially in winter. I keep my screws from my foot in a little jar on my table at work—always a good way to gross people out. The DOC (or previous DOC) employee(s) that inspire or enthuse me most are Cam Speedy and the other members of the Whio Recovery Group who are so passionate about whio, even after some of them have worked with them for so many years (not looking at anyone in particular Peter Russell and Andy Glaser). This also demonstrates how great a species whio are to work with. Most people don’t know that I was born in Akaroa and that I have a twin sister (not identical – I have been asked). My best ever holiday was a nine week trip to North America a couple of years ago. We visited 15 National Parks and numerous National Monuments and State Parks in the USA and another three National Parks in Canada. The highlights of the trip would have been Utah and Arizona (Zion NP, Grand Canyon NP, Monument Valley, Natural Bridges National Monument, Arches NP, Canyonlands NP, Dead Horse State Park, Grand Staircase-Escalante National Monument, Capital Reef NP and Bryce Canyon NP), along with New York City and the Labrador Coast. A walk over Clouds Rest in Yosemite NP was also very cool. Another trip also right up there was when I saw Mountain Gorillas in what was then Zaire, climbed sand dunes and walked to the bottom of Fish River Canyon in Namibia, paddled around in a dug out canoe on the Okavango Delta and got saturated by the spray at Victoria Falls. In my spare time I tend to do things around the house as we have just built a house and there are always plenty of little jobs to do. If I could be any New Zealand native species I’d be either a bottlenose dolphin or kareakarea/New Zealand falcon. If I wasn’t working at DOC, I’d like to still be working with animals. Not sure where but definitely working with animals. Before working at DOC I worked as a forest technician undertaking time and motion studies. My favourite quote is – (I don’t have one, I’m not really a quote type of guy). The best piece of advice I’ve ever been given is – I can’t think of what that would be but I’d have to say if it was, it would probably be “Don’t sweat the small stuff”. In work and life I am motivated by trying to enjoy it as it seems to be getting shorter by the minute. My conservation advice to New Zealanders is take conservation seriously; it shouldn’t just be a ‘nice to do’ and shouldn’t be seen as a cost, but an investment in the future.